The Route Hunt Branch was established in 1958 and is part of Pony Club Area 17. Our branch has on average between 70-80 members aged from 4 yrs up to 24yrs! We run a full and varied programme throughout the year based around the working rally which is the backbone of any branch. Mounted and unmounted instruction is offered at working rallies and at junior rallies. Junior rallies are open to our younger members and to new members of any age who may not yet be very experienced in riding. At various times throughout the year we offer more specialized instruction in Dressage, Show jumping, Cross Country, Games and Tetrathlon which will help all members advance their knowledge in these disciplines and prepare them for area competitions if they are selected. Membership 2019 - new members always welcome! 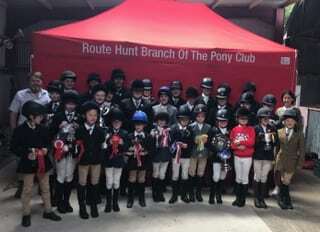 The Route Hunt is a Branch or Area of The Pony Club.